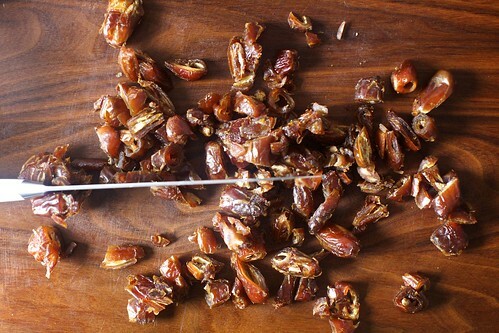 Prior to last month, I had spent exactly zero minutes of my life thinking about date cake, craving date cake or noting the absence of date cake in my life and/or site archives. Clearly, this was a misstep on my part, but I’d always assumed they were exceedingly sticky sweet, and also, well warm. I should just stop right here rather than confessing the latest entry in How Weird Are Deb’s Food Tastes?, I know I should, but that’s never stopped me before so here goes: I’m not very into warm, quivery desserts. Like soufflés. And oozy chocolate cakes. I basically don’t understand how I survived the 90s either. I understand if this means you cannot speak to me anymore. But all of this changed at a party, when, to be honest, it was getting late and I was tired from being roused awake before 6 that morning by a unnamed Kindergartener and mentally calculating how long it would take to get home in a cab vs. two subway lines and I was not craving dessert or cake in the least but I had a bite and all of this mental noise stopped, which is to say it was nothing short of a miracle, even if it hadn’t been spectacular. But it was that, too. This cake is so good and while it’s definitely sweet, it’s not exceedingly so. And one bite of the butterscotch sauce ladled over the humble square of cake forced me to reconsider everything I once thought I disliked about warm desserts. I love it when that happens. This recipe hails from the first cookbook from Sunday Suppers, a cooking series and event space in Williamsburg, with stunning picture windows looking out over the bridge. Karen Mordechai, the founder and author, was inspired by the famed date cake at Moto, a restaurant under an elevated subway line nearby. A little Googling evidenced that it has something of a cult following, and if this version is as close to the original as promised, I’m not remotely surprised. Smitten Kitchen on Pinterest: Did you know that you can follow the Smitten Kitchen on Pinterest too? Plus, I’ve been working in the last couple weeks to get the page ready for holiday cooking with new boards with Everything Pumpkin (it’s the most wonderful tiiiiime of the year! ), Thanksgiving: Savory (gobble, gobble), Thanksgiving: Sweet (mm, pie), Homemade Food Gifts, plus All The Cookies in the archives, because I promise, there’s nothing wrong with you that two cookies can’t fix. Hope that helps get your kitchen engines started. This cake would be as welcome on a holiday dinner table, which is what I most associate it with, yet is simple enough to be an ideal consolation prize for another dark, rainy fall day. I only made a couple changes such as adding a little salt to the cake itself, and a little sea salt to the top of the sauce, which nicely contrasts the sweetness. The original recipe calls for a 10×10-inch pan, which I have rarely seen and do not own. I used a 9×13-inch instead, and needed much, much less baking time (yay). It makes for a slightly thinner cake, but also more servings. You could easily serve 12 to 20 people with this. 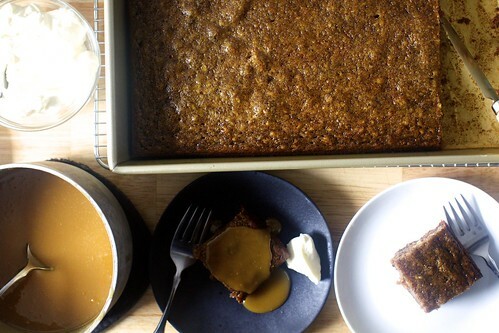 You could also halve everything and bake it in an 8×8-inch square pan. 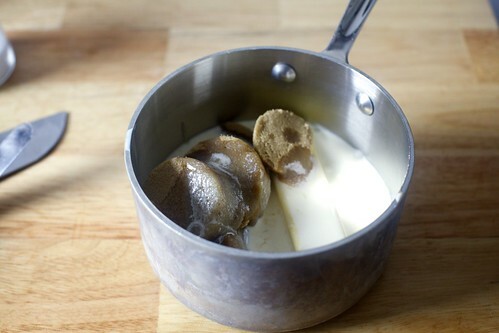 Make the cake: Pit and roughly chop dates and place them in a heatproof bowl. Pour boiling water over them and stir in the baking soda. Cover the bowl and set it aside for 30 minutes. Meanwhile, heat oven to 350°F (175°C). 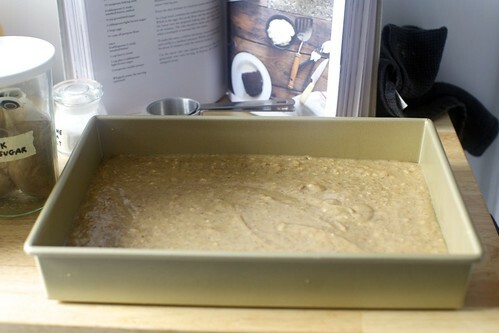 Butter a 9×13-inch baking pan. 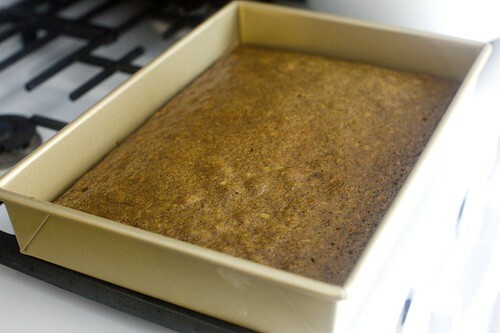 As an extra precaution, if you’re nervous about sticking (although this cake should not), you can line the bottom with a fitted rectangle of parchment paper. 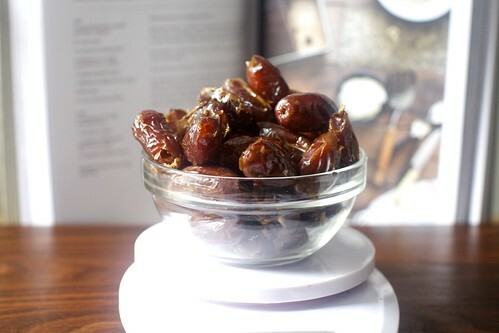 Blend date-water mixture in a blender or food processor until smooth. In a large bowl, combine the melted butter and sugars. Whisk in eggs, then salt. Stir in the flour, then date puree. Pour the batter into the prepared pan and bake for 25 to 30 minutes, until a toothpick inserted into the center comes out clean. To serve it rustic-style, as we did, let it cool in the pan on a cooling rack. 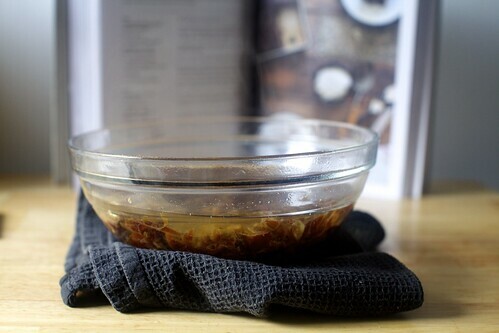 If you’d like to transfer it later to a serving plate, let cool in the pan for 20 minutes, then flip it out onto a cooling rack, removing the parchment paper if you used it. 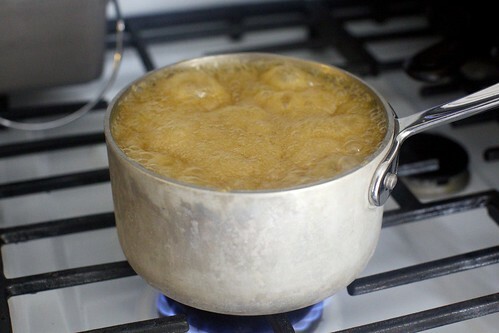 Make the sauce: Combine butter, cream, sugar and vanilla in a larger saucepan than you think you’ll need (I vote for 2 1/2 to 3 quarts) over medium heat and bring to a simmer. Whisk for about 10 minutes, until the mixture thickens slightly. To serve: Cut the cake into squares (still warm is just fine). 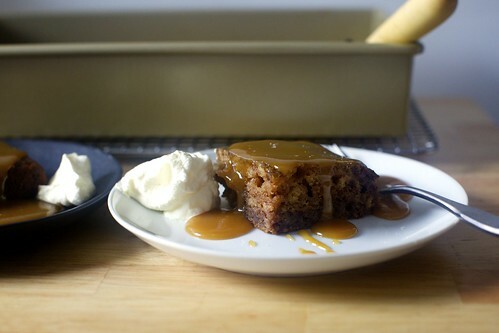 Drizzle each slice with toffee sauce, a pinch of sea salt, and top with a dollop of whipped cream, if desired. If your mint plant has survived the fall better than mine has, a leaf or two would be lovely here, too.